Sumo Ball Are you a Dodge Ball champ? Then try it Sumo style. 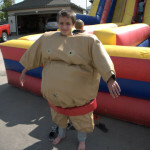 Suit up in our Adult or Junior Sumo Suits, then run, jump and dodge the ball. Last sumo standing wins! . Comes with 4 sumo suits and dodge ball.